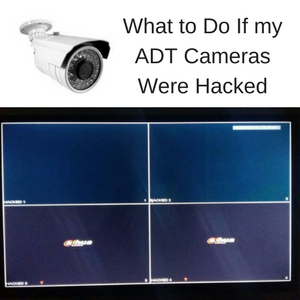 If you’re wondering what to do if your ADT cameras are hacked, you’ve come to the right spot! With news stories of credit reporting agencies being breached and other sensitive information being compromised, being more vigilant about protecting yourself and your security is becoming more and more important. Let’s talk about what to do if someone has your security cameras, and how you can tell. Also, we may just have a bonus section about this you can do to help prevent your cameras from being hacked. If someone has hacked your security cameras, they will say the word “hacked” as the name for each camera as shown in the image above. This vulnerability is only present in ADT cameras that have a certain type of DVR. ADT Pulse Cameras are not capable of being hacked like these DVRs can. Update your firmware. That simple. Doing this can help fix your problem and help correct your security’s vulnerability. To make sure you have the most up-to-date firmware, we recommend contacting ADT. Has Someone Hacked Your ADT Cameras? Knowing that your security cameras have been compromised is, of course, crucial. There are a couple things you can do to help keep your cameras from being hacked. First things first, make sure that you secure your wireless network. Security cameras can be a huge asset to your home security system, allowing you to record activity and even check in for live feed with technology like ADT Pulse from the palm of your hand. But you’ll want to be vigilant in regularly checking up on your security system!